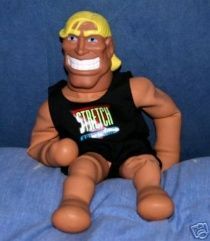 Earlier this month, we reported that Breck Eisner (The Crazies) was in talks to direct the live-action adaptation of the disposable toy Stretch Armstrong. Today, Relativity Media has sent out a press release confirming that Eisner has the gig. According to the press release, “This original story will be a gritty actioner introducing the character of Lucas Armstrong and the life-or-death consequences he will face after undergoing a transformation granting him superhuman abilities.” That’s right: someone is going to make a “gritty actioner” based on a toy that’s filled with gelled corn syrup. Hit the jump to read the press release. Stretch Armstrong opens April 11, 2014. (Beverly Hills, Calif.) July 19, 2012 – Relativity Media has closed a deal with Breck Eisner (The Crazies, Sahara) to direct its upcoming live-action film based on Stretch Armstrong, it was announced today by Relativity’s President, Tucker Tooley. Relativity partnered with global branded play company Hasbro, Inc. [NASDAQ-HAS] to develop and produce the film which is targeted for an April 11, 2014 release date. Relativity will be the domestic distributor and will release the film internationally through its network of foreign output partners. Eisner, known for directing the remake of George A. Romero’s horror movie The Crazies, will helm the film based on the script written by Dean Georgaris (Lara Croft Tomb Raider: The Cradle of Life, The Manchurian Candidate). The film will be produced by Relativity’s CEO, Ryan Kavanaugh (The Fighter), Hasbro’s CEO Brian Goldner (Transformers) and Bennett Schneir, Senior Vice President and Managing Director, Motion Pictures (Battleship). Tooley (Immortals) will serve as executive producer. “We were delighted by Breck and Dean’s innovative and creative concept for bringing this character to life. Their unique vision for creating the mythology for this story paired with their experience gives us the confidence that they are the perfect team to bring Stretch Armstrong to the big screen,” said Tooley, President, Relativity. This original story will be a gritty actioner introducing the character of Lucas Armstrong and the life-or-death consequences he will face after undergoing a transformation granting him superhuman abilities.